Happy May the Fourth. This is the last in a series of Star Wars adoption movie reviews. In this sixth film, a rebellion is raging against an evil Emperor, and Luke confronts his father in an attempt to save his from his master, the Emperor. Here are links in case you want to read the Adoption Movie Guides of the earlier films: The Phantom Menace, Attack of the Clones, Revengeof the Sith, A New Hope, and The Empire Strikes Back. Luke and Leia were both adopted. As is the case in some adoptions, they didn’t know about each other. In this film, though, Luke and Leia learn that they are siblings and (spoiler alert……….) it’s confirmed that Darth Vader is their father. 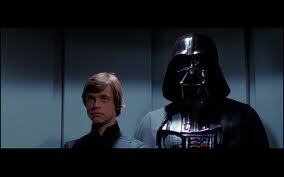 Luke confronts his father because he believes that his father must have some good in him yet. His father believes that it is too late to change, and that his allegiance is inextricably devoted to the Emperor. There is a recurring theme of secrecy – Luke is confronts a mentor who had lied to him about his father. There is also a theme of the importance of genetics – Luke and Leia have both inherited skills and gifts from their father. 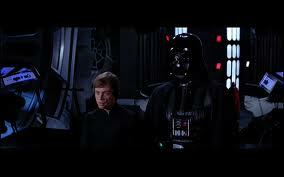 Prior to their reconciliation, Vader acknowledges that he may have to kill Luke. 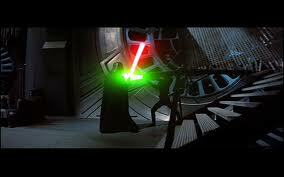 Luke cuts off Vader’s hand in a (bloodless) duel. I’m troubled by the advice that the good guys give Luke. Yoda and Obi-Wan (Ben) Kenobi are two Jedi masters, supposedly wise warrior/philosophers. They chose to hide the truth from Luke – and when they are confronted, their answers and advice are troubling and disappointing. Luke asks Yoda if Darth Vader is his father. Yoda rolls over and says he needs rest. Luke persists, and Yoda acknowledges, “your father he is. Told you, did he?” Luke explains that he has. Yoda replies that it is “unexpected… and unfortunate.” Luke asks, “Unfortunate that I know the truth?” Yoda replies, “No. Unfortunate that you rushed” and that you were “not ready.” And then, Luke apologizes. In essence, Yoda believed that Luke couldn’t yet handle the truth about his father, and so, Luke ends up apologizing for doing wrong, which seems like a type of false guilt that might be unfortunately familiar to adoptees. Yoda advises Luke that if he ever gives into anger, fear, or aggression, they will forever “dominate your destiny.” This seems to imply that people can’t change. Some scenes might be frightening to young viewers – there are threats of peril and laser-based sci-fi violence. 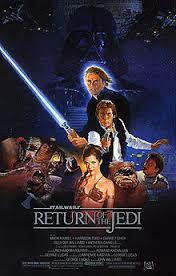 Return of the Jedi is a satisfying conclusion to the six-film series. If you watch only the middle films, Anakin seems inescapably evil, but the series taken in as a whole shows that he is a person with loves and passions who made a series of understandable but damaging and wrong choices. He could not care for his children, but remained, at his essence, a good person – or at the very least, a person who was not wholly evil. Luke’s faith in his father’s innate goodness is affirmed. This could be a powerful film for adopted viewers and their families. The deeper message about Vader’s goodness might be most helpful to viewers who have reached the mid-teenage years. The movie can be used to illustrate that – just because your birthparent has done wrong things – they aren’t a bad person, and neither are you. Was Luke right? Did Vader still have good in him? How do you separate what a person has done from whether they are good? The Emperor and Vader both did horrible things – what made them different? How did Leia feel when she learned that Luke was her brother? How do you think Luke felt when he asked Ben why he had been lied to? Have you ever been lied to about your adoption? Is there anyone that you think still has good in them, even if other people seem to think otherwise? I have enjoyed this series, Addison.